Black Forest Cake was a staple when I was growing up (much to my dismay…read on). You know, the grocery store kind with the nuclear red maraschino cherries? My mom loooooved that cake and always got it for her birthday, and often at other times throughout the year as well. This was epically disappointing to me. Why on earth would you ruin a perfectly delicious cake with those sickly sweet, sticky, artificial tasting cherries? Whyyyyy? Needless to say, I ate around them, but they totally tainted the cake and frosting. Sad times. Now that I think about it, it’s probably been a good 20-25 years since I’ve had that cake. I’ve talked about my disdain for maraschino cherries before, and that feeling still holds true to this day. I have caved and used them as garnish because, I will admit, they look pretty and just go with certain desserts, but they get plucked right off before eating the cake. Thing is, I actually love cherries. Real cherries. Fresh cherries. They are one of my favourite summer seasonal fruits. 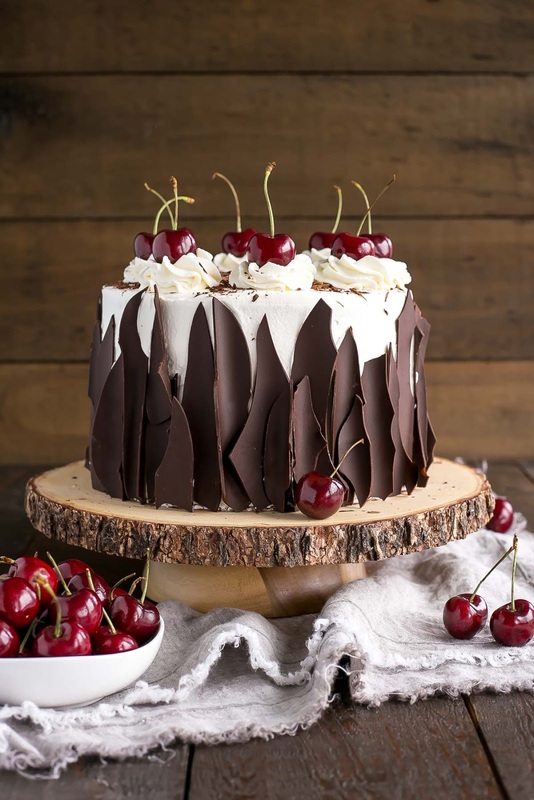 So, I set off to re-create the decades old Black Forest Cake my way. Preheat oven to 350F, grease two 8" round baking pans and dust with cocoa powder. Line bottoms with parchment. In a medium bowl whisk all wet ingredients (pour hot water in slowly as not to cook the eggs). Bake for 45 mins or until a cake tester comes out mostly clean. Cool 10 minutes in the pans then turn out onto a wire rack to cool completely. Place sugar and water into a small pot. Stir and bring to a boil. Simmer for 1 min then remove from heat. Stir in cherry liqueur and allow to cool completely. Whip cream and powdered sugar until stiff peaks. Ideally in a cold bowl with a cold whisk. Melt chocolate over a double boiler or in 20 second bursts in the microwave. Using a large offset spatula, spread melted chocolate in a thin layer on a large sheet of parchment. Roll up from the short side of the parchment. Place on a baking sheet and refrigerate or freeze until firm. Unroll to create chocolate bark. Cut each cake layer in half horizontally. Place one layer of cake on a cake stand or serving plate. Brush generously with cherry syrup. Top with approximately 1 cup whipped cream and spread evenly. Top with approximately 1 cup of cherries and gently press them into the whipped cream. Repeat with remaining layers and frost the outside of the cake. Decorate with chocolate bark, chocolate shavings, rosettes, and cherries if desired. Chocolate Bark tutorial here and here. 0 Response to "BLACK FOREST CAKE"